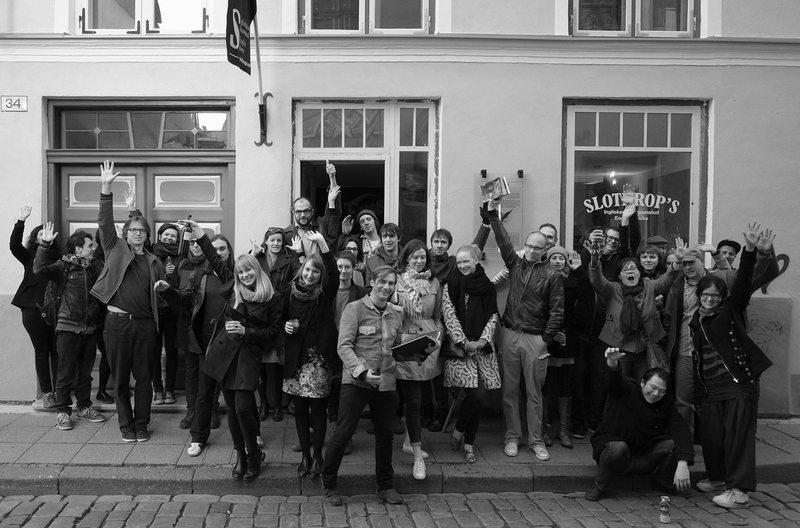 We opened Slothrop’s English language bookshop in Tallinn in December 2011. It was Estonia’s first second-hand English language bookstore. We had a range of contemporary fiction and a pretty diverse selection of non-fiction, with an at times quite exceptional history section. We hosted events from stand-up comedy to poker nights and developed a special relationship with the Writers’ Union of Estonia, giving us an opportunity to retail translations of Estonian authors to visitors and tourists. These translations – our way of exporting Estonian culture to the world! – were often our biggest sellers. The shop was kept open by the generosity and kindness of the volunteers who ran it – about 20-25 people in total. You know who you are! Without them giving their time Slothrop’s would never have survived for as long as it did. It was a truly great place to have been involved in. Scott told us he had plans to open a bookshop in Tallinn — “every European capital can support at least one English-language shop, why not Tallinn?” — and that he had even acquired some 800 paperbacks, which were currently occupying his sauna. And that his wife was damn near ready to leave him unless those boxes of books finally found a home. My friend and I, both involved in the arts, were interested in such a venture and so we came to an agreement that we would provide the time and labour while Scott would provide the initial inventory and capital. We opened our doors on December 17th, 2011. Opening a shop in the winter is a certainly an unusual choice; however, Scott assured us everything would be fine and that at the very least the expat community would rally and support us through those the first few months. And he was right: we were almost immediately visited by a number of US embassy officials and, notably, the British Ambassador to Estonia. Under the impression that they were simply interested in our bookshop, we were happy to receive them and any visitors we had during that long cold winter. Then, in the spring, large consignments of books began to arrive in boxes without return addresses. No bill or invoice was contained within the boxes, only a small handwritten note asking us to sell or distribute them ‘as we see fit’. On further inspection I could tell they had been shipped by a freight company operating out of Szczytno-Szymany Airport because of the Polish post office stamp marks and an errant packaging label. However, when I did further research on the name of this freight company, I could find no trace of their existence online. The books were generally in good condition and sold well. We were happy to get any support we could in that first year of business. One of the books was Natural Cures “They” Don’t Want You to Know About by Kevin Trudeau. After several months of manning the store, I began to notice this one particular book. Sat on an obscure shelf well away from casual eye-line, it would only ever be picked up and perused by two gentlemen who, it should be mentioned here, never bought anything. Each would come by the shop on their respective days and always at the same time, never crossing paths. Always picking up the same Kevin Trudeau title for two or three minutes in the same dark corner of the store. After this cycle had repeated several times I opened up the book. It was unremarkable in every possible way with the exception of a small typewritten note nestled in the spine, containing the pangram. Curious and intrigued, I mentioned the note to Scott, who assured me that it was nothing to be concerned about, that the gentleman were probably just indecisive buyers and that we should expect to see all sorts of strange people in an eccentric little bookshop like Slothrop’s. Immediately following my finding the note, another gentleman, who told me his name was Pat, started stopping by. Pat started to visit us often on Saturday afternoons, killing time before Premiership football games began in the nearby sports bar. He was a Scottish native and Russian speaker who enjoyed fishing and was something of an outdoorsman. He told me that his wife was interested in herbal remedies and that Kevin Trudeau’s Natural Cures “They” Don’t Want You to Know About would be of great interest to her. He asked if he could take photographs of the book, so that he could show her to see if she would like to buy it. Amiable and happy to help a customer, I let him take his photographs. A smoker, Pat always had a box of matches with him; however, I was most surprised to see that he also kept a tiny digital camera in his matchbox. I assumed the camera was some hi-tech Japanese contraption. When I asked Pat about it, he quickly told me his son had bought it for him, before rushing out the shop, concealing the camera below his trench coat. I said a new customer, Pat, had taken an interest in it because his wife… Scott rushed out of the shop before I could finish explaining. He was nervously muttering about a ‘red fox in the nest’ as the door swung shut behind him. At that moment I began to recall Scott’s talk of the ‘Agency’… of how easily the shop had been funded… of the strange packages of free books from a near non-existent company… of the strange visitors in trench coats… the odd notes. But what did it all mean!? Slothrop’s English language bookshop was a great place full of interesting people and excellent books. Open three and half years, until mid-2015 when we decided to close the business. I met for the first time many people who would become great friends. I read books I would never have picked up before and hosted events and parties that I won’t forget in a long time. Slothrop’s was a great place. Hopefully in the future someone else will have the motivation to open another English language bookshop in Tallinn. And maybe they too will get the love and support from the community we so enjoyed. Not all of the preceding article was true, but Slothrop’s was very much a real shop and still maintains its Facebook page – www.facebook.com/slothrops – where you can find an huge selection of book recommendations, photographs and all sorts of ephemera. What a cool post and such an intriguing story. I am sorry I never knew about this bookstore, as I would’ve definitely been a regular (from Finland). I’m sorry to say that even though I love books, I have abandoned paperbacks for Kindle.